Finally the time has come to celebrate 100(+) Followers! 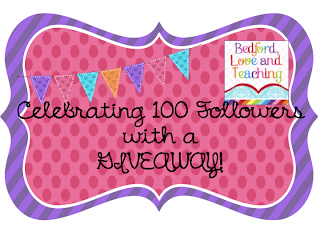 I've got some awesome prizes to giveaway! This giveaway will last for one week. Make sure you grab my button above so you can blog/share/pin about this giveaway...each day you earn more points! Good luck everyone and thank you! If I could have 100 K-cups, I would be happy. For like two weeks! I would like 100 iPads for my grade level and a few for my family! Don't forget, tomorrow is your day to be featured on New Teacher Blog Tuesday! Congrats on 100! I would take 100- $100 bills.